In many auction houses in countries like the United Kingdom and the United States of America, some classic cars are fetching millions due to their high demand. In such cases, the profits from the sale of the car go to the owner, often tax-free. Unlike Singapore, some cars in western countries, especially desirable classic ones, can appreciate in value. Such cars are seen as an asset, similar to a (freehold) house in a desirable neighbourhood. Its value will only go up as time goes on, and fewer examples remain available. Obviously, the better condition the classic car is in, the most expensive it will be. But no matter how well-preserved a car from the 1950s and 60s may be, it is still a car from yesteryear. Thus, it is likely to have issues from the then production line, and a lack of safety features. Carmakers are starting to catch on that affluent people don’t just want fast and luxurious modern cars. Recently, there was a lift in regulations from big car manufacturing countries like the UK with regards to continuation cars. Continuation cars are new-old cars that follow the production number series from when production stopped decades ago. Thus, carmakers with significant historical pedigrees like Aston Martin and Jaguar have decided to remake some of their greatest hits. Late in 2016, British carmaker Aston Martin announced that they would be remaking 25 of its iconic DB4GT. First introduced in 1959, the same year Aston Martin won the 24-hour endurance Le Mans race, it was a lighter and faster version of the regular DB4. During its time, it was the fastest sports car in England. The remakes will also be produced in the same factory the original 75 DB4GTs were produced. That would be in the company’s iconic factory about 100km of London by their subsidiary, Aston Martin Works. The subsidiary focuses on restoring and preserving old Aston Martins from the company’s history of over a century. The identification numbers of the 25 old-new handmade DB4GTs will continue on, picking up where the factory left off in 1963. The new cars will retain the original look of the DB4GT, with upgraded production technology and safety features. Sticking with the car’s pedigree, the new-old DB4GT will only be track-certified, not for use on the road. In terms of price, Aston Martin would cost around US$1.9 million (S$2.61 million) for the new-old DB4GT. A bargain as compared to an original DB4GT in top-notch condition, which would cost around US$3 million (S$4.12 million). Some companies want to do it to make money, while other do so for a sense of fulfilment and to finish what they started decades ago. At the Salon Retromobile vintage car show in Paris early this year, fellow British carmaker Jaguar unveiled something iconic. It was a factory-built recreation of the company’s famous open-top D-Type sports car. The D-Type two-seater Jaguar was produced back in the 50s as a street racer for the road. Meant for Jaguar’s more exclusive and discerning customer, its appeal came from the car winning the Le Mans in 1955, 1956 and 1957. Apart from its engineering, its design won the hearts of Jaguar’s customers too, with its curvy body and aeronautically-inspired rear fin. During production, only 75 of the originally planned 100 D-Types were produced. Fast forward to 2018, Jaguar now wants to complete production of its final 25 D-Types. The new-old D-Types will be made with brand new, vintage-style parts that are period-correct. Similar to Aston’s old-new DB4GT, the production numbers will continue on from the last D-Type that rolled off the production line back in 1957. Reportedly, the 25 old-new D-Types will cost seven figures each. But, the price tag is actually a huge bargain, as a D-Type recently came under the hammer and was sold for US$21.8 million (S$30 million). It’s not just carmakers with rich heritages that are looking to the past. Instead of making their own, some automotive companies take existing classic cars and give them a new lease on life. Across the Pacific at the sunny shores of California, two companies did just that. Eric Hutchison spent thousands of hours restoring and rebuilding an old Ferrari. What he achieved in the end was spectacular: an electric 1978 Ferrari 308 GTS. Hutchison works for Electric GT, a company specialising in electric car conversion. As it turned out, his electric 308 happened to be faster than a stock 308 GTS. Surprisingly, the so-called 308 ‘GTE’ (Electric) completed the lap 10 seconds quicker. When Hutchison found the original 1978, it was in a fire-damaged condition and was nearly impossible to restore. But after spending US$10,000 (S$13,800), he had a usable Ferrari car shell. Describing the Ferrari’s original state, he said “it had been burned up in a fuel fire, gasoline leaked on the motor. It smelled, all the rubber was melted, there was broken glass. It was frankly a mess”. After two years of painstaking restoration work, in which Hutchison had quit four times, the first ever electric Ferrari was made. Moving away from installing electric motors into restored fire-damaged cars, there are also companies that take existing classic cars and make them better. Singer Vehicle Design is a company based in Los Angeles that works on old Porsches. Their main product is a ‘re-imagined’ version of the German carmaker’s most iconic sports car, the 911. The company usually works on 964s, a generation of 911s that were made in the late 1980s to the early 90s. Singer replaced a large portion of the car’s body with carbon fibre panels, which is much lighter than steel. The car’s engines were also reworked by engine specialists like Cosworth to produce more power. 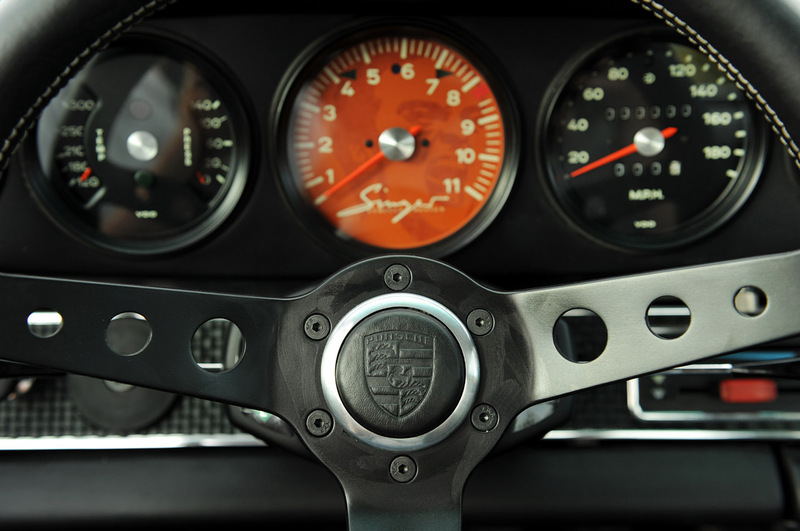 But, the change Singer Porsche enthusiasts got most excited about was new its rev (revolution) counter. Singer coloured the rev counter in their own special shade of orange and maxed the number up to 11. The 11 is a tribute to This is Spinal Tap, a 1984 movie that coined the phrase, “up to eleven”. This was despite the fact that the engine was only able to rev up to the red line of 7,900 revs per minute. The price for a 911 Singer starts at US$475,000 (S$654,383) and desirable specimens can reach almost US$2 million (S$2.76 million) at auctions. Those more expensive ones usually have bespoke or motorsports-grade components. Such cars like those listed above are usually not found or officially sold in Singapore and have to be privately imported in. What do you think about such cars? Do you think we should be able to purchase them in Singapore? Let us know in the comments below!